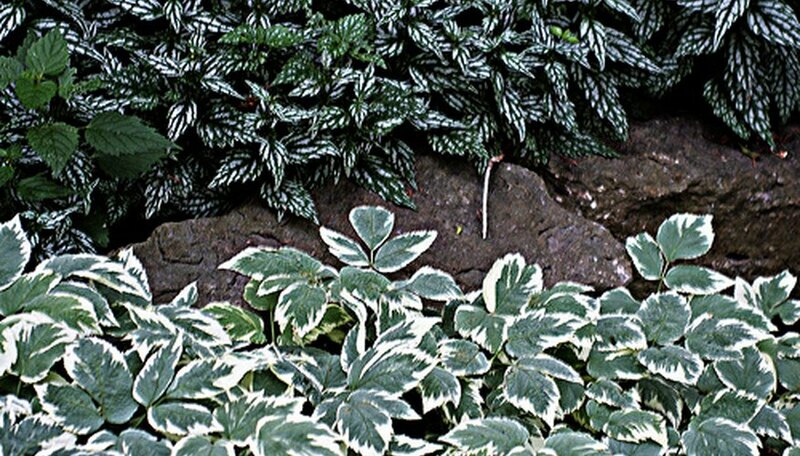 Bishop’s weed, otherwise known as Aegopodium, is a green or green and white variegated plant used as ground cover. It grows well in zones 4 through 8. It spreads quickly and easily by underground stolons (roots), and can become quite aggressive. It is propagated by division and seeds. Bishop's weed can thrive in some of the worst soils, and can tolerate full sunlight if it’s kept moist. It grows 12 to 12 1/2 inches tall and produces small white flowers in May and June. Grow bishop's weed in an area by itself because it is invasive. Find an area where it's okay if the bishop's weed spreads. If you’re concerned about spreading, locate an area that has natural barriers, such as a row of rocks or pavement, which can contain the spread. Plant bishop’s weed in the spring or fall. Make shallow holes, about 2 inches deep and 6 to 8 inches apart. Plant the bishop’s weed, spreading out the roots as you go. Water the plants thoroughly. Keep the soil moist and don’t let it dry out. Bishop’s weed prefers well-drained and evenly-moist soil. Cut the plants back and water them well if they become brown (likely in full or partial sun). A new set of leaves will grow within a month. Bishop's weed grows best in shady areas and under trees and bushes. If you share your plants, let the recipient know that bishop's weed can become invasive and difficult to remove once it's established.